A suspected Hizbul terrorist, who made an abortive attempt to target a CRPF convoy by a car bomb in Banihal on Jammu-Srinagar national highway on Saturday, was arrested Monday and is being questioned, PTI quoted police sources say. After a gas cylinder blast in a Santro car near a CRPF convoy at Tether village on Saturday, a high alert was sounded in Jammu and Kashmir. 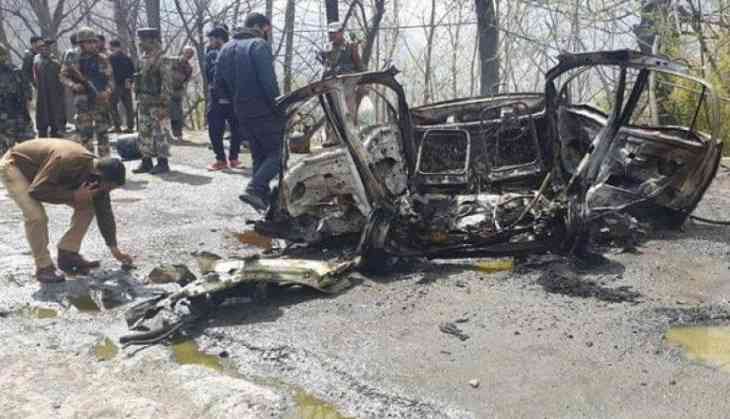 A CRPF vehicle had suffered slight damage when a car exploded, shortly after a Jammu-bound convoy crossed the Jawahar Tunnel, the gateway to Kashmir valley. “The driver of the private vehicle managed to flee before the fire engulfed the vehicle and turned it into a mangled heap of iron. The inspection of the vehicle and surrounding areas led to the recovery of LPG cylinders, a jerrycan filled with petrol, gelatin stick, urea and sulphur -- material which is used for fabricating the Improvised Explosive Devices (IED),” police told PTI. According to sources, a massive hunt was launched and finally, the suspected terrorist was arrested in the early hours of Monday and is being questioned. According to PTI, a note recovered from the scene had identified the driver as a Hizbul Mujahideen operative, who mentioned his intention to carry out a February 14 Pulwama type terror attack which left 40 CRPF personnel dead after a terrorist of Jaish-e-Mohammad (JeM) outfit drove an explosive-laden vehicle and targeted a CRPF convoy.